3. How long we delivery take?….Delivery time is dependent on your location. USA is within 7 days after order processed. Europe is generally 7-14 days after order processing. Rest of world is generally 14-21 days after order processing. Please allow up to 5 working days for order processing (We need this time to eliminate fraud and ensure cleared payment. 4. How long is the warranty?.. All items are covered by their respective manufacturer warranty, unless otherwise stated on product page. 5. Why am I redirected to Amazon to make the purchase?.. 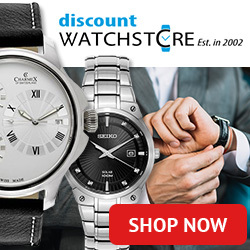 As well as a direct seller, we are an Amazon associate and as such sometimes we direct people to the best offers on watches available through Amazon. 6. When I was directed to Amazon, I found they weren’t able to deliver to my country, what can I do?… If this is the case, please contact us (using the contact us form) and advise us of the exact watch band, model and number, and your country for delivery. We may be able to arrange a special order for you. There will be a 12% surcharge for this, and payment option will depend on your location. 7.What is your phone number? We are an online store only. All communications is via email to ensure clarity in communication and records are kept of our communication with customers for future reference.